Living on the lake is very different from living anywhere else. Since living on the lake — even if it is just for a weekend — is different, shouldn’t the houses be different? 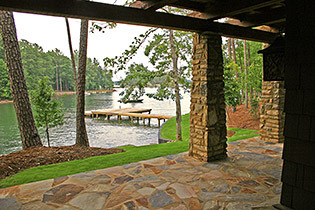 The most attractive and valuable houses on Lake Martin have one thing in common — they are designed for the lake! 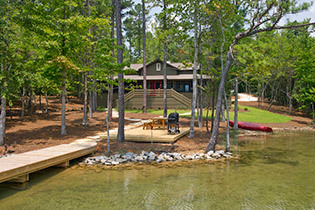 What is the perfect lake house? These four quick lessons provide the answer. Lesson #1 – It is all about the water! Many people miss this lesson entirely. Waterfront lots are relatively expensive (sometimes half the total real estate value). Why build a house if you don’t take advantage of the water? The first question is, how much waterfront footage do you have? Check local zoning for the maximum allowable pier/dock. Then consider the topography. Lots of folks are only willing to consider a flat lot. Remember that flat lots are flat under the water surface too. That means you will have a shallow depth under the pier. Flat lot equals shallower water, where steeper lots equal deeper water (typically). Other important considerations are: Big water views are not just expansive – they can be expensive so consider that in making a budget. Quiet coves make for calmer swimming. Beaches naturally occur in rare occasions on the lake. Lake life frequently requires water toys, so lake homes should have water toy rooms on the lake side of the home for all the tubes, wakeboards, rafts, noodles, etcetera, that you will likely use. Lesson #2 – The front door faces the lake! Lots of folks want the city house to have curb appeal, but at the lake the street side of the house is seen twice — once upon arrival and once (sadly) at departure. What a lake house needs is pier appeal. You see more of this side, so time should be spent on making this angle as attractive as possible. 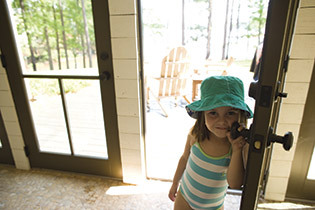 Treat that lake side door like the front door. Make the lakeside porches look like terraces. Landscape the lakeside with maintenance and appearance as primary considerations. And most importantly you want to look out at the front “lake yard.” Lake houses should have all the most important rooms — kitchens, dining, living and owners bedroom facing the lake. There is nothing quite as beautiful as water, and a lake home should have expansive windows so you can enjoy the view. Lesson #3 – Bring the outside inside! 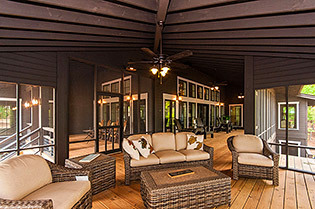 Well-designed lake homes have a good bit more covered outdoor living space than city homes. The reason for this is because it is more fun being outside at the lake! The best way to bring the outdoors in is to maximize views with larger than normal windows so you can see nature. Then, you should create enough covered outdoor spaces to screen some of them. That way you are actually bridging the transition from inside to outside and vice-versa. You know you have it right when you leave the air conditioning in the morning and you don’t return to it until dinner time. Lesson #4 – Bedrooms are for sleeping! First, know that you will rediscover forgotten aunts, uncles, nephews and friends the moment you post on Facebook that you acquired a lake home. Since all those folks are coming to visit, you should have plenty of room to sleep at least eight folks. And do not worry about making sure little Johnny’s and little Suzie’s bedrooms are as large as they are back home. They are only going to sleep there. Once the sun comes up, they are outside exploring nature. In fact, you are too, so don’t worry about that space. Use your budget to adhere to the first three lessons!